Newtownbutler or Newtown Butler is a small village in County Fermanagh, Northern Ireland. 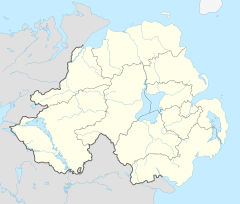 It is in the southeast corner of the county, near Lough Erne, the border with County Monaghan, and the town of Clones. It is surrounded by small lakes and bogland. In the 2011 Census it had a population of 970 people. Newtownbutler began to be built as a Plantation village in the early 18th century. It was built within the townland of Aghagay. Originally known as Newtown, it was renamed Newtownbutler when Theophilus Butler was created Baron of the area in 1715. The local terrain was the undoing of some of the Jacobite forces in 1689 in the Battle of Newtownbutler. A Williamite force of less than 1000 Enniskillen troops captured and killed 3000 of James II’s troops here after they had got lost in an unmarked bog. There were thirteen deaths in and around Newtownbutler during the Troubles. Crom Estate, Newtownbutler, owned by the National Trust, covers over 1,900 acres (8 km2) of woods, parkland and wetland and is one of Ireland's most important nature conservation areas with the largest surviving area of oak woodland in Northern Ireland. There are also many attractive buildings on the estate, including Crom Old Castle and the romantic folly, Gad Island Tower. The wealth of wildlife at Crom is highlighted by the presence of two rare butterflies - the purple hair-streak and leptidea sinapis, as well as the pine marten and the largest herony in Ireland. The 19th century castle is private and not open to the public. The parish currently has two pubs, An Chead Chumann and Mulligans Bar and Lounge which regularly host an array of events and attract crowds in from across the country. Reilly's Hotel was also another well known public house in the village but closed in 2004 and was used in the Ulster American Folk Park in Omagh. The village also has two shops, two takeaways, a butchers, a chemists, a credit union, a parish hall, a community Centre, GAA Grounds and a large community park up the town. William Thompson (1733–1799) the first President of the Methodist Conference after Wesley's death was born in Newtownbutler. Charles Irwin (1824-8 April 1873) was born in Manorhamilton, County Leitrim and was an Irish recipient of the Victoria Cross. During the Siege of Lucknow on 16 November 1857 at Lucknow, India, Private Irwin showed conspicuous bravery at the assault on the Secundra Bagh when, although severely wounded through the right shoulder, he was one of the first to enter the building under heavy fire. He died on 29 March 1873 at Newtownbutler and is buried in Saint Mark's Churchyard, Magheraveely, County Fermanagh. Constantine Scollen (4 April 1841 - 8 November 1902) was born just outside the village, on Galloon Island in Loch Erne. He became a famous missionary among the native peoples of North America and actually lived with the people of the Blackfoot Confederacy in Canada for almost a decade. In total he spent over thirty years on the prairies. He died in Dayton, Ohio, in 1902. Newtownbutler railway station opened on 26 June 1858 and finally closed on 1 October 1957. There are plans by Waterways Ireland to restore the nearby Ulster Canal from Lough Erne to Clones. 19% indicated that they had a British national identity, 53.5% had an Irish national identity and 27.8% had a Northern Irish national identity. Newtownbutler is home to the Newtownbutler First Fermanagh's GAA football team. They play at all levels of football in both the men's and women's categories. Their last Fermanagh Senior Championship title came in 2007. Micky Jones and Francy Brown prove to be a dynamic duo for the Firsts. Knowing each other on a deep level on and off the field this has really paid dividends to the firsts and they were praised by Current manager Patrick Glancy. There are six marching bands operating in Newtownbutler Ward. Four are from Newtownbutler while the other two operate in the nearby village of Magheraveely. The four from Newtownbutler are: Feaugh Pipe Band; Loughkillygreen Accordion Band; Newtownbutler Flute Band; and Wattlebridge Accordion Band. According to County Fermanagh Grand Orange Lodge, Newtownbutler District No.1 is the largest district in the county with ten men's lodges and one women's lodge. The District covers the wards of Newtownbutler and Rosslea. Five lodges operate within Newtownbutler and its immediate surrounding area. These are: LOL 184 Newtownbutler; LOL 391 Wattlebridge; LOL 854 Loughkillygreen; LOL 1219 Crom Castle; and LOL 1320 Feaugh. There are also three Royal Black Preceptory lodges operating in the Newtownbutler area. They are: RBP 154 Newtownbutler; RBP 204 Loughkillygreen; RBP 811 Drummully. ^ "Newtownbutler station" (PDF). Railscot - Irish Railways. Retrieved 22 November 2007. This page was last edited on 13 February 2019, at 00:16 (UTC).